Welcome back to the HCC V&E Blog. We’ve been on hiatus for awhile as the program has seen some staff turnover. However, we’re back and ready to give good information to our students and the Kansas grape and wine industry. Please allow me to introduce Randall (Randy) Miller, HCC’s new Viticulturist. Randy manages the HCC vineyards, teaches our viticulture classes, and is our new vineyard guru regarding consultation for the industry. I’ll let him tell a bit about himself and share our most recent thoughts regarding growing grapes in Kansas. Hello, I’m Randy Miller. 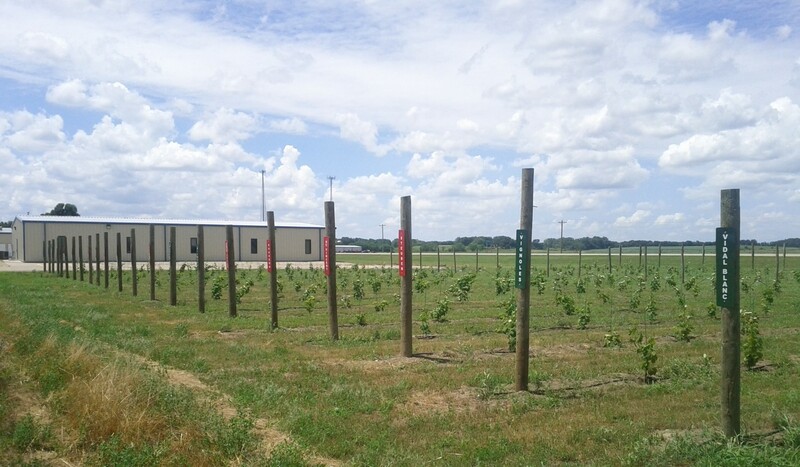 I started as the viticulturist seven months ago in beautiful Wamego, Ks. I’m at least a third generation farmer/rancher. I went to Oklahoma State University and majored in Plant & Soil Science, minored in Entomology, and completed coursework for a MS in Range Ecology. My desire to help ag producers and conserve our natural resources led me to work for the USDA and, eventually the US Air Force on the Central Coast of California. This is where I developed my love of wine and started taking viticulture classes. The value added aspect of grapes as wine, was also a major factor in this. I returned to Oklahoma and decided to start a grapevine nursery. I continued taking viticulture courses through OSU, Greyson CC, and the Texas Extension Service. In 2007 I started teaching viticulture at OSU-OKC (campus in Oklahoma City), but by 2009 the recession caused university wide funding reductions and termination of the program. Along with all of those other viticulture activities, I began taking enology classes through VESTA. The winemaking courses gave me a better sense of the broad picture of the industry from both the grower and winery perspective. The current cold spell (March 10-15) came just in time for the northern 2/3 of the state. Hopefully it will delay budbreak until after the last frost. Unfortunately some areas in the southern part of Kansas had budbreak around a month early, and likely experienced some damage. Records show that December 18th (2016) was the record cold for some mesonet weather station locations. Many areas were at least -17 F (Table below shows temperatures in Rossville, KS). The low temperature extreme is highly dependent on location, and mostly elevation. Obviously we haven’t been to every vineyard in Kansas, but this low extreme killed both primary and secondary buds of many of the varieties we’ve seen. Many had canes and tertiary buds damaged as well. These were all north and east of Manhattan, so we hope the southern half escaped severe damage. We also saw a large amount of trunk/wood diseases such as bot canker (Eutypa). If it is not pruned out, those diseases can and likely will kill the vine. If you haven’t started pruning yet then we recommend that you delay to see what is still alive and buds out, particularly in the northern half of the state. If you haven’t pruned in the southern part, you should also delay until the danger of frost has past. If you’ve already started pruning then you may want to leave extra buds to compensate for damage. HCC V&E is hosting a vineyard workshop on April 22nd, starting at 9am in Wamego. At this workshop we’ll cover all of these issues in more depth, as well as cold mitigation and cordon conversion (for excess vigor) at a workshop April 22nd at our Wamego campus. One last item of note. HCC V&E is proud to announce that we have hired a new Enologist. Mr. Matthew Kahl will be joining us from New Mexico. I’ll let Matt give the details about his background in another post. His first day with HCC will be March 29th, 2017. We’re excited to have him aboard!! If you any inquiries about HCCV&E or are interested in consultations for your vineyard or winery contact us.